Popular in the 17th Century, this large, yellow and fragrant fruit is a relative of the pear. The varieties used include 'Vranga' and 'Meecher's Prolific'. 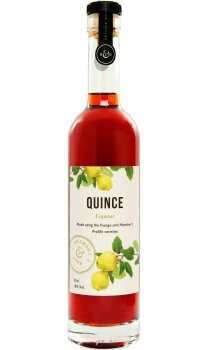 Delicious as an aperitif or as an after-dinner digestif this liqueur is also a great accompaniment to strong cheese. Add to a pork or chicken stir-fry sauce for an original sharp and sweet taste. Free from preservatives and colourings. Use within 3 months of opening for freshest flavour.